Pioneer 10 on its kick motor prior to encapsulation before launch. Credit: NASA Ames Resarch Center (NASA-ARC). Pioneer 10 is a 258-kilogram robotic space probe that completed the first mission to the planet Jupiter and became the first spacecraft to achieve escape velocity from the Solar System. Def. astronomy performed by a satellite, spacecraft, space probe, or astronaut that has left the cozy confines of an orbit around the Earth is called exploratory astronomy. The charged particle instrument (CPI) is used to detect cosmic rays in the solar system. Credit: NASA. The cosmic-ray telescope collects data on the composition of the cosmic ray particles and their energy ranges. Credit: NASA. The launch of Pioneer 10 aboard an Atlas/Centaur vehicle. Credit: NASA Ames Resarch Center (NASA-ARC). This diagram shows the interplanetary trajectory for Pioneer 10. Credit: NASA. ISEE-3 is inserted into a "halo" orbit on June 10, 1982. Credit: NASA. This image shows the Voyager 1 spacecraft. Credit: NASA. The plot shows a dramatic increase in the rate of cosmic ray particle detection by the Voyager 1 spacecraft (October 2012). Credit: . Pioneer 10 was launched on March 2, 1972 by an Atlas-Centaur expendable vehicle from Cape Canaveral, Florida. Between July 15, 1972, and February 15, 1973, it became the first spacecraft to traverse the asteroid belt. "In 1972, the return of the galactic cosmic rays in the inner solar system to solar minimum conditions and the launch of Pioneer 10 toward Jupiter coincided to make possible the measurements of the low-energy cosmic-ray charge spectra during solar quiet times." "Recent measurements using the Goddard-University of New Hampshire cosmic-ray telescope on the Pioneer 10 spacecraft have revealed an anomalous spectrum of nitrogen and oxygen nuclei relative to other nuclei such as He and C, in the energy range 3-30 MeV per nucleon." "To eliminate [the solar cosmic-ray background] a very careful selection of times must be made to assure that solar cosmic rays are not obviously present [by] requiring that the 10-20 MeV proton intensity measured on the same experiment be essentially at background level." The International Cometary Explorer (ICE) spacecraft was originally known as [the] International Sun/Earth Explorer 3 (ISEE-3) satellite. ISEE-3 was launched on August 12, 1978. It was inserted into a "halo" orbit about the libration point some 240 Earth radii upstream between the Earth and Sun. ISEE-3 was renamed ICE (International Cometary Explorer) when, after completing its original mission in 1982, it was gravitationally maneuvered to intercept the comet P/Giacobini-Zinner. On September 11, 1985, the veteran NASA spacecraft flew through the tail of the comet. The X-ray spectrometer aboard ISEE-3 was designed to study both solar flares and cosmic gamma-ray bursts over the energy range 5-228 keV. Gamma-ray bursts, 0.05-6.5 MeV direction, profile, spectrum. The Voyager 1 spacecraft is a 722 kg (1,592 lb) space probe launched by NASA on September 5, 1977 to study the outer Solar System and interstellar medium. The Cosmic Ray System (CRS) determines the origin and acceleration process, life history, and dynamic contribution of interstellar cosmic rays, the nucleosynthesis of elements in cosmic-ray sources, the behavior of cosmic rays in the interplanetary medium, and the trapped planetary energetic-particle environment. Measurements from the spacecraft revealed a steady rise since May in collisions with high energy particles (above 70 MeV), which are believed to be cosmic rays emanating from supernova explosions far beyond the Solar System, with a sharp increase in these collisions in late August. At the same time, in late August, there was a dramatic drop in collisions with low-energy particles, which are thought to originate from the Sun. Ulysses' second orbit: it arrived at Jupiter on February 8, 1992, for a swing-by maneuver that increased its inclination to the ecliptic by 80.2 degrees. Credit: NASA. "For a satellite or space probe to qualify as a deep space X-ray astronomer/explorer or "astronobot"/explorer, all it needs to carry aboard is an XRT or X-ray detector and leave Earth orbit." "Ulysses is launched October 6, 1990, and reached Jupiter for its "gravitational slingshot" in February 1992. It passed the south solar pole in June 1994 and crossed the ecliptic equator in February 1995. The solar X-ray and cosmic gamma-ray burst experiment (GRB) had 3 main objectives: study and monitor solar flares, detect and localize cosmic gamma-ray bursts, and in-situ detection of Jovian aurorae. Ulysses was the first satellite carrying a gamma burst detector which went outside the orbit of Mars. The hard X-ray detectors operated in the range 15–150 keV. The detectors consisted of 23-mm thick × 51-mm diameter CsI(Tl) crystals mounted via plastic light tubes to photomultipliers. The hard detector changed its operating mode depending on (1) measured count rate, (2) ground command, or (3) change in spacecraft telemetry mode. The trigger level was generally set for 8-sigma above background and the sensitivity is 10−6 erg/cm2 (1 nJ/m2). When a burst trigger is recorded, the instrument switches to record high resolution data, recording it to a 32-kbit memory for a slow telemetry read out. Burst data consist of either 16 s of 8-ms resolution count rates or 64 s of 32-ms count rates from the sum of the 2 detectors. There were also 16 channel energy spectra from the sum of the 2 detectors (taken either in 1, 2, 4, 16, or 32 second integrations). During 'wait' mode, the data were taken either in 0.25 or 0.5 s integrations and 4 energy channels (with shortest integration time being 8 s). Again, the outputs of the 2 detectors were summed." "The Ulysses soft X-ray detectors consisted of 2.5-mm thick x 0.5 cm2 area Si surface barrier detectors. A 100 mg/cm2 beryllium foil front window rejected the low energy X-rays and defined a conical FOV of 75° (half-angle). These detectors were passively cooled and operate in the temperature range −35 to −55 °C. This detector had 6 energy channels, covering the range 5–20 keV." The image shows the spectral range for the violet filter of Voyager 1 and Voyager 2. Credit: Xession. The image on the right shows the spectral range for the violet filters of Voyager 1 and Voyager 2. 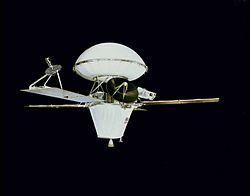 Mariner 10 is the first probe to visit the innermost planet (1974–75). Credit: NASA. This is an artist's rendering of the MESSENGER spacecraft orbiting Mercury. Credit: NASA. Mariner 10 provided the first close-up images of Mercury's surface, which immediately showed its heavily cratered nature. On November 29, 2012, NASA confirmed that images from the space probe Mercury Messenger had detected that craters at the north pole contained water ice. Sean C. Solomon was quoted in the New York Times as estimating the volume of the ice as large enough to "encase Washington, D.C., in a frozen block two and a half miles deep." "The MESSENGER spacecraft [an artist's impression on the lowwer right] is the first ever to orbit the planet Mercury, and the spacecraft's seven scientific instruments and radio science investigation are unraveling the history and evolution of the Solar System's innermost planet. During the first two years of orbital operations, MESSENGER acquired over 150,000 images and extensive other data sets. MESSENGER is capable of continuing orbital operations until early 2015." Mariner 10 false color UV Venus image has been processed from Clear and Blue and UV filters. Credit: Ricardo Nunes. When imaged in the ultraviolet on the right, Venus appears like a gas dwarf object rather than a rocky object. The image on the lower right has been re-processed through the clear, blue, and UV filters of Mariner 10 from the image taken of Venus by Mariner 10 on May 5, 1974, to show greater detail. This colour mosaic was assembled from 18 images taken by Galileo's imaging system through a green filter. Credit: NASA/JPL/USGS. "During its mission, the Galileo spacecraft returned a number of images of Earth's only natural satellite. Galileo surveyed the moon on Dec. 7, 1992, on its way to explore the Jupiter system in 1995-1997." "This color mosaic was assembled from 18 images taken by Galileo's imaging system through a green filter. On the upperleft is the dark, lava-filled Mare Imbrium, Mare Serenitatis (middle left), Mare Tranquillitatis (lower left), and Mare Crisium, the dark circular feature toward the bottom of the mosaic. Also visible in this view are the dark lava plains of the Marginis and Smythii Basins at the lower right. The Humboldtianum Basin, a 400-mile impact structure partly filled with dark volcanic deposits, is seen at the center of the image." Mars Express has aboard a radar imager. Credit: NASA. Mars Odyssey has a neutron detector aboard. Credit: NASA. "In 1997, before the arrival of the Mars Pathfinder spacecraft (the first NASA Lander sent to Mars since Viking), the Hubble Telescope was tasked to acquire a series of "weather forecast Mars images" prior to the landing [at left]." A more general definition of 'sky' allows for skies as seen on other worlds. At right is a 360° panorama of the horizon on Mars as perceived in the visual true-color range of the NASA Mars Exploration Rover 'Spirit' on November 23-8, 2005. "[O]bservations from the SPICAM spectrometer on the Mars Express spacecraft ... of the [oxygen] green line [are compared with simulations]". Japan launched its Hayabusa2 into space on a mission to blast a hole into an asteroid and bring samples of it back to Earth. Credit: JAXA. This is the first image of the asteroid Ida using the green 559 nm filter onboard the Galileo spacecraft. Credit: NASA/JPL. "The Japan Aerospace Exploration Agency's (JAXA) Hayabusa2 asteroid mission blasted off Tuesday (Dec. 2) at 11:22 p.m. EST (0422 GMT Dec. 3) from the country's Tanegashima Space Center, where the local time at liftoff was 1:22 p.m. on Wednesday, Dec. 3. If all goes well, the spacecraft should return samples of the asteroid 1999 JU3 to Earth in late 2020, JAXA officials said." "Hayabusa2 is JAXA's bigger, bolder follow-up to its historic Hayabusa mission, which brought the first pristine samples of an asteroid to Earth in 2010 after its own seven-year mission." "Asteroid 1999 JU3 is a so-called carbonaceous, or C-type, space rock — a different type of asteroid than the rocky (S-type) asteroid Itokawa visited by the first Hayabusa. Scientists suspect asteroid 1999 JU3 holds water and organic materials — some of the building blocks of the solar system." "Minerals and seawater which form the Earth as well as materials for life are believed to be strongly connected in the primitive solar nebula in the early solar system. Thus we expect to clarify the origin of life by analyzing samples acquired from a primordial celestial body such as [this] asteroid to study organic matter and water in the solar system, and how they coexist while affecting each other." "While Hayabusa2 studies asteroid 1999 JU3 from orbit, it will deploy three rovers and a German/European lander called MASCOT, all of which will work independently on the surface to gather information on the asteroid's composition and history." "The spacecraft will make three landings by itself, each time putting the material collected in a separate chamber for return to Earth. Meanwhile, three rovers (collectively called Minerva II) and the small MASCOT lander will transmit information from the surface to Hayabusa2." "After completing operations at 1999 JU3, Hayabusa2 will then make the one-year journey back to Earth for an expected landing in the Australian outback late in 2020." "This is the first full picture showing both asteroid 243 Ida and its newly discovered moon to be transmitted to Earth from the National Aeronautics and Space Administration's (NASA's) Galileo spacecraft--the first conclusive evidence that natural satellites of asteroids exist. Ida, the large object, is about 56 kilometers (35 miles) long. Ida's natural satellite is the small object to the right. This portrait was taken by Galileo's charge-coupled device (CCD) camera on August 28, 1993, about 14 minutes before the Jupiter-bound spacecraft's closest approach to the asteroid, from a range of 10,870 kilometers (6,755 miles). Ida is a heavily cratered, irregularly shaped asteroid in the main asteroid belt between Mars and Jupiter--the 243rd asteroid to be discovered since the first was found at the beginning of the 19th century. Ida is a member of a group of asteroids called the Koronis family. The small satellite, which is about 1.5 kilometers (1 mile) across in this view, has yet to be given a name by astronomers. It has been provisionally designated '1993 (243) 1' by the International Astronomical Union. ('1993' denotes the year the picture was taken, '243' the asteroid number and '1' the fact that it is the first moon of Ida to be found.) Although appearing to be 'next' to Ida, the satellite is actually in the foreground, slightly closer to the spacecraft than Ida is. Combining this image with data from Galileo's near-infrared mapping spectrometer, the science team estimates that the satellite is about 100 kilometers (60 miles) away from the center of Ida. This image, which was taken through a green filter, is one of a six-frame series using different color filters. The spatial resolution in this image is about 100 meters (330 feet) per pixel." This movie of changes in Jupiter's cloud patterns is from Voyager 2 acquired in the Violet filter around May 6, 1979. Credit: NASA/JPL. This is an artist's impression of JUNO near Jupiter. Credit: NASA. Galileo has this electron detector aboard. Credit: NASA. Although observed and studied from Earth for centuries it wasn't until the mid 1970's that humans were able to get a closer look with the spacecraft Pioneer 10 and 11. The Voyager 1 and 2 spacecraft were launched with the specific purpose of collecting information and data on the Jovian worlds. "Experiments on the Voyager 1 and 2 spacecraft and observations made by the International Ultraviolet Explorer (IUE) have provided evidence for the existence of energetic particle precipitation into the upper atmosphere of Jupiter from the magnetosphere." In December 1995 the Galileo spacecraft entered into orbit and began it's long-term study of Jupiter and it's moons, a probe was also sent deep into the atmosphere of the gas giant. NASA's Galileo spacecraft made at least two different orbits around Jupiter. "Galileo flew near Europa on May 31, 1998, during the spacecraft's 15th orbit of Jupiter, with lower-resolution color information obtained on June 28, 1996, during Galileo's first orbit." "NASA's Galileo spacecraft took [images of the] dark terrain within Nicholson Regio, near the border with Harpagia Sulcus on Jupiter's moon Ganymede." Gases above Io's surface produced a ghostly glow that could be seen at visible wavelengths (red, green, and violet). Credit: NASA/JPL/University of Arizona. At right is an "eerie view of Jupiter's moon Io in eclipse ... acquired by NASA's Galileo spacecraft while the moon was in Jupiter's shadow. Gases above the satellite's surface produced a ghostly glow that could be seen at visible wavelengths (red, green, and violet). The vivid colors, caused by collisions between Io's atmospheric gases and energetic charged particles trapped in Jupiter's magnetic field, had not previously been observed. The green and red emissions are probably produced by mechanisms similar to those in Earth's polar regions that produce the aurora, or northern and southern lights. Bright blue glows mark the sites of dense plumes of volcanic vapor, and may be places where Io is electrically connected to Jupiter." "North is to the top of the picture, and Jupiter is towards the right. The resolution is 13.5 kilometers (8 miles) per picture element. The images were taken on May 31, 1998 at a range of 1.3 million kilometers (800,000 miles) by Galileo's onboard solid state imaging camera system during the spacecraft's 15th orbit of Jupiter." The image at the left was taken in visible green light. The image at the right has been color-coded to make faint signals in the plume more apparent. Credit: NASA. At right is a pair of images showing "[a] fine spray of small, icy particles emanating from the warm, geologically unique province surrounding the south pole of Saturn’s moon Enceladus[. It] was observed in a Cassini narrow-angle camera image of the crescent moon taken on Jan. 16, 2005. Taken from a high-phase angle of 148 degrees -- a viewing geometry in which small particles become much easier to see -- the plume of material becomes more apparent in images processed to enhance faint signals [right image of the pair]." "Though the measurements of particle abundance are more certain within 100 kilometers (60 miles) of the surface, the values measured there are roughly consistent with the abundance of water ice particles measured by other Cassini instruments (reported in September, 2005) at altitudes as high as 400 kilometers (250 miles) above the surface." "The image at the left was taken in visible green light. A dark mask was applied to the moon's bright limb in order to make the plume feature easier to see." "The image at the right has been color-coded to make faint signals in the plume more apparent. Images of other satellites (such as Tethys and Mimas) taken in the last 10 months from similar lighting and viewing geometries, and with identical camera parameters as this one, were closely examined to demonstrate that the plume towering above Enceladus' south pole is real and not a camera artifact. The images were acquired at a distance of about 209,400 kilometers (130,100 miles) from Enceladus. Image scale is about 1 kilometer (0.6 mile) per pixel." This is an image of Iapetus in polarized green light with the Cassini spacecraft narrow-angle camera. Credit: NASA/JPL/Space Science Institute. The color seen here on this false-color composite of Iapetus is similar to that produced in (red, green and blue) natural color views. Credit: NASA / JPL / Space Science Institute. "Although it is no longer uncharted land, the origin of the dark territory of Cassini Regio on Iapetus remains a mystery. Also puzzling is the equatorial ridge that bisects this terrain, and how it fits into the story of the moon's strange brightness dichotomy. The ridge is seen here, curving along the lower left edge of Iapetus. The view looks down onto the northern hemisphere of Iapetus (1,468 kilometers, or 912 miles across), and shows terrain on the moon's leading hemisphere." "The image was taken in polarized green light with the Cassini spacecraft narrow-angle camera on Nov. 12, 2005 at a distance of approximately 417,000 kilometers (259,000 miles) from Iapetus and at a Sun-Iapetus-spacecraft, or phase, angle of 95 degrees. Image scale is about 2 kilometers (1 mile) per pixel." In the second image are three "different false-color views of Saturn's moon Iapetus show the boundary of the global "color dichotomy" on the hemisphere of this moon facing away from Saturn. The "color dichotomy," which has been detected in images from the Cassini imaging team, is a second global pattern found on Iapetus besides the well-known global brightness dichotomy." "This image consists of three panels, each of which was contrast-enhanced in different ways to bring out surface features. Minimal enhancement was applied to the image on the left panel while those on the middle and right panels were enhanced more (with contrast increased by factors of two and four, respectively), making them appear brighter and overexposed." "In the case of the color dichotomy seen here, its boundary is quite well correlated with the boundary between the moon's leading and the trailing hemispheres. At near-infrared wavelengths, the bright terrain on the leading side is redder than on the trailing side. This pattern is visible in the panel on the left, which uses normal contrast enhancement. The characteristic reddish distribution also appears on the dark material, as seen in the middle and right-hand panels that have been adjusted with even higher contrast. Indeed, the otherwise uniformly dark material shows different color hues, depending on whether the viewer looks at the leading vs. the trailing side." This image of Tethys is taken in visible green light with the Cassini spacecraft narrow-angle camera on September 14, 2011. Credit: NASA Cassini. At right is an image of Saturn's moon Tethys in green light. "On the top left of the image there is huge Odysseus Crater. See PIA07693 for a closer view. On the bottom right there is Ithaca Chasma, a series of scarps that runs north-south across the moon for more than 620 miles (1,000 kilometers). North on Tethys is up and rotated 25 degrees to the right." "This view looks toward the area between the leading hemisphere and Saturn-facing side of Tethys (660 miles, or 1,062 kilometers across)." "The image was taken in visible green light with the Cassini spacecraft narrow-angle camera on Sept. 14, 2011. The view was acquired at a distance of approximately 178,000 miles kilometers (287,000) from Tethys and at a Sun-Tethys-spacecraft, or phase, angle of 11 degrees. Image scale is about 1 mile (2 kilometers) per pixel." Engineers at NASA's Jet Propulsion Laboratory pose with the completed Galileo orbiter and probe. Credit: NASA/JPL. This is an image of the Solid-State Imaging camera of the Galileo spacecraft. Credit: NASA/JPL. "[T]he Solid State Imaging (SSI) camera ... [at right of the Galileo spacecraft] uses a high-resolution, 800 x 800 charge-coupled device (CCD) array with a field of view of 0.46 degrees. Multi-spectral coverage is provided by an eight-position filter wheel on the camera, consisting of three broad-band filters: violet (404 nm), green (559 nm), and red (671 nm); four near-infrared filters: 727 nm, 756 nm, 889 nm, and 986 nm; and one clear filter (611 nm) with a very broad (440 nm) passband." The Voyagers have a violet filter that was used to image astronomical objects. Credit: NASA. The scan platform of Voyager 1 and 2 comprises: the Infrared Interferometer Spectrometer (IRIS) (largest camera at right) in the image at left; the Ultraviolet Spectrometer (UVS) to the right of the UVS; the two Imaging Science Subsystem (ISS) vidicon cameras to the left of the UVS; and the Photopolarimeter System (PPS) barely visible under the ISS. At right is an image of the spectral range of the Violet filter (50 to 400 nm) on the Imaging Science System aboard the Voyager 1 and Voyager 2 Spacecraft, as defined by the instrument descriptions of the Narrow Angle Camera and Wide Angle Camera. Viking 1 launched aboard a Titan IIIE rocket August 20, 1975 and arrived at Mars on June 19, 1976. Credit: NASA. "Each Viking Orbiter was equipped with two identical vidicon cameras. The camera system is commonly called the Visual Imaging Subsystem (VIS). Each camera consists of a telescope, a slow scan vidicon, a filter wheel, and associated electronics. The filter wheel contains blue, minus blue, violet, clear [no filter], green, and red filters." "The radiometric calibration converts the digitized signal received from the camera (DN value) into a quantity that is proportional to the radiance reaching the sensor. The sensitivity of the vidicon varies across the field of view. The sensitivity of the vidicon also varies with time. Each Viking Orbiter imaging instrument was calibrated before flight. In addition, changes in the calibration over time have been estimated from analyses of images of deep space and dust storms. The radiometric calibration applies additive and multiplicative corrections that account for the varying sensitivity of the vidicon. The resulting values are proportional to radiance factor, which is defined as the ratio of the observed radiance to the radiance of a normally illuminated lambertian reflector of unit reflectance at the same heliocentric distance. The geometric calibration removes electronic distortions and transforms the point perspective geometry of the original image into a map projection. The electronic distortions are barrel-shaped distortions from the electron beam readout and complex distortions from interactions between the charge on the vidicon face plate and the electron beam. The electronic distortions are modeled by comparing the undistorted locations of reseau marks with the actual locations in an image." "The VIS detector is a Westinghouse 5166 selenium vidicon. It is about 3.7 cm (1-1/2 in.) in diameter." "The saturation current from the vidicon is 43 nA. The residual dark current is 0.2 nA. The response of the visual imaging subsystem is linear to first order. Analyses of imaging data acquired inflight indicate that the system is linear to within 3% over its dynamic range." The blue filter is centered at 470 nm with a range from 350-530 nm. The violet filter is centered at 440 nm with a range of 350-470 nm. "The filter transmittance was measured using a Cary 14 spectrophotometer with a spare set of filters." The path of Pioneer 11 past Jupiter is shown (a) from above the north pole of the planet, and (b) as seen from the equatorial plane. Credit: University of Arizona, Observing Team, and NASA. Pioneer 11 is identical to Pioneer 10 but was sent on a different trajectory. The path of Pioneer 11 past Jupiter is shown in the diagrams on the right: (a) from above the north pole of the planet, and (b) as seen from the equatorial plane. "Pioneer 11 [1973-019A, launched on 1973-04-06, with an Atlas-Centaur] was the second mission to investigate Jupiter and the outer solar system and the first to explore the planet Saturn and its main rings. Pioneer 11, like Pioneer 10, used Jupiter's gravitational field to alter its trajectory radically. It passed close to Saturn and then it followed an escape trajectory from the solar system." "Pioneer 11's star sensor gain and threshold settings were modified, based on experience gained from the settings used on Pioneer 10." "During its closest approach, 03 December 1974 (SCET-UT) , Pioneer 11 passed to within 43,000 km of Jupiter's cloud tops. It passed by Saturn on 01 September 1979, at a distance of 21,000 km from Saturn's cloud tops. The spacecraft has operated on a backup transmitter since launch. Instrument power sharing began in February 1985 due to declining RTG power output. Science operations and daily telemetry ceased on 30 September 1995 when the RTG power level was insufficient to operate any experiments. As of the end of 1995 the spacecraft was located at 44.7 AU from the Sun at a nearly asymptotic latitude of 17.4 degrees above the solar equatorial plane and was heading outward at 2.5 AU/year." Exploratory astronomy has been conducted within the Solar System for at least five decades. ↑ Fimmel, R. O.; W. Swindell, and E. Burgess (1974). SP-349/396 PIONEER ODYSSEY. NASA-Ames Research Center. ISBN SP-349 Check |isbn= value: invalid character (help). Retrieved 2011-01-09. ↑ 2.0 2.1 2.2 F. B. McDonald, B. J. Teegarden, and J. H. Trainor and W. R. Webber (February 1. 1974). "The anomalous abundance of cosmic-ray nitrogen and oxygen nuclei at low energies". The Astrophysical Journal 187 (02): L105-8. doi:10.1086/181407. http://adsabs.harvard.edu/full/1974ApJ...187L.105M. Retrieved 2012-12-05. ↑ E. Bell II (December 8, 2012). ISEE 3. National Aeronautics and Space Administration. Retrieved 2012-12-08. ↑ Kawakatsu Y (December 2007). "Concept study on Deep Space Orbit Transfer Vehicle". Acta Astronaut 61 (11–12): 1019–28. doi:10.1016/j.actaastro.2006.12.019. http://www.sciencedirect.com/science?_ob=ArticleURL&_udi=B6V1N-4NH6CFG-5&_user=10&_rdoc=1&_fmt=&_orig=search&_sort=d&_docanchor=&view=c&_searchStrId=1096021697&_rerunOrigin=scholar.google&_acct=C000050221&_version=1&_urlVersion=0&_userid=10&md5=8a44d13acdcfcb84dffbed85fd24993b. ↑ Smith W. Explorer Series of Spacecraft. ↑ 7.0 7.1 7.2 7.3 Marshallsumter (April 15, 2013). X-ray astronomy. San Francisco, California: Wikimedia Foundation, Inc. Retrieved 2013-05-11. ↑ Kenneth Chang (2012-11-29). On Closest Planet to the Sun, NASA Finds Lots of Ice. New York Times. p. A3. ↑ NASA/Johns Hopkins University Applied Physics Laboratory/Carnegie Institution of Washington (21 November 2013). Tolstoj and Nureyev. Retrieved 2015-02-03. ↑ 10.0 10.1 Yvette Smith (December 8, 2009). Earth's Moon. NASA. Retrieved 2012-07-22. ↑ Richard C. Hoagland (2002). Revealing Mars' True Colors ... of NASA. TheEnterpriseMission Website. Retrieved 2014-02-25. ↑ Guillaume Gronoff, Cyril Simon Wedlund, Christopher J. Mertens, Mathieu Barthélemy, Robert J. Lillis, Olivier Witasse (May 2012). "Computing uncertainties in ionosphere-airglow models: II. The Martian airglow". Journal of Geophysical Research 117 (A5). doi:10.1029/2011JA017308. ↑ 13.0 13.1 13.2 13.3 13.4 13.5 Elizabeth Howell (2 December 2014). Japan Launches Asteroid-chasing Probe to Bring Space Rock Samples to Earth. SPACE.com. Retrieved 2014-12-08. ↑ JAXA (2 December 2014). Japan Launches Asteroid-chasing Probe to Bring Space Rock Samples to Earth. SPACE.com. Retrieved 2014-12-08. ↑ Sue Lavoie (February 1, 1996). PIA00136: Asteroid Ida and Its Moon. Pasadena, California USA: NASA/JPL. Retrieved 2013-01-25. ↑ T. E. Cravens (1987). "Vibrationally excited molecular hydrogen in the upper atmosphere of Jupiter". Journal of Geophysical Research 92 (A10): 11,083-100. doi:10.1029/JA092iA10p11083. http://www.agu.org/pubs/crossref/1987/JA092iA10p11083.shtml. Retrieved 2012-07-09. ↑ Sue Lavoie (October 30, 2002). PIA03878: Ruddy "Freckles" on Europa. Washington, D.C. USA: NASA's Office of Space Science. Retrieved 2013-06-24. ↑ Autumn Burdick (December 16, 2000). PIA02582: Stair-step Scarps in Dark Terrain on Ganymede. Pasadena, California USA: NASA/JPL. Retrieved 2014-06-12. ↑ 19.0 19.1 Sue Lavoie (October 13, 1998). PIA01637: Io's Aurorae. Pasadena, California: NASA and the Jet Propulsion Laboratory, California Institute of Technology. Retrieved 2012-07-22. ↑ 20.0 20.1 20.2 20.3 Sue Lavoie (November 28, 2005). PIA07760: Spray Above Enceladus. Pasadena, California: NASA and the Jet Propulsion Laboratory, California Institute of Technology. Retrieved 2012-07-22. ↑ 21.0 21.1 Sue Lavoie (December 26, 2005). PIA07660: A Moon with Two Dark Sides. NASA and the Jet Propulsion Laboratory, California Institute of Technology. Retrieved 2012-07-22. ↑ 23.0 23.1 23.2 Tony Greicius (February 3, 2012). Cassini Unlocking Saturn's Secrets. NASA. Retrieved 2012-08-09. ↑ David R. Williams (June 13, 2008). Galileo (1990, 1992). Greenbelt, MD 20771 USA: NASA Goddard Space Flight Center. Retrieved 2013-01-25. ↑ M. Benesh and F. Jepsen (August 6, 1984). SP-474 Voyager 1 and 2 Atlas of Six Saturnian Satellites Appendix A The Voyager Mission. Washington, DC USA: NASA. Retrieved 2013-04-01. ↑ 27.0 27.1 27.2 David R. Williams (21 March 2017). Pioneer 11. Greenbelt, Maryland USA: Goddard Space Flight Center. Retrieved 2017-04-25.